How do you benefit from using the Salesforce SMS plugin? The Salesforce plugin of CM solves 2 things. 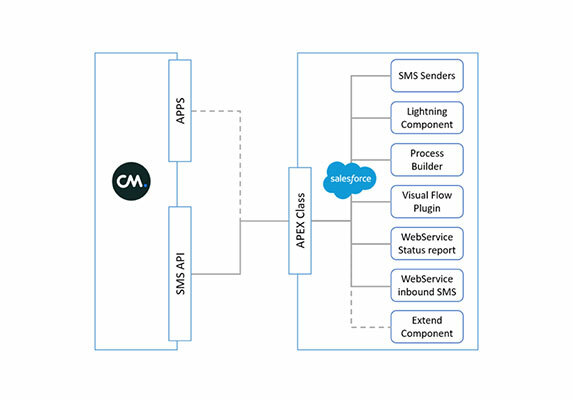 Firstly it connects Salesforce to the CM SMS API. Secondly it gives you several 'building blocks' that can be used in Salesforce processes, screens, flows and so on. The CM SMS Connector is prized for the fact that it gives you freedom in customising SMS in your own screens and processes. This also means you don’t get an overkill of features you’re never going to use, you can create your own clean solution. The managed package is designed to give you easy customisable (2-way) SMS features in Salesforce. Enjoy the benefits of the fast and reliable CM platform for sending messages in Salesforce. No need for a custom and costly solution to integrate SMS in your Salesforce environment. The CM SMS components in Salesforce can be customised for your own fit. Salesforce is much more than a CRM system nowadays. You can manage your sales, marketing, service, commerce, community, workflows and much more in this leading cloud platform. No wonder that each company uses Salesforce in a different way and with different configuration. That’s why CM created the most flexible SMS component to make the perfect fit in your business processes. What are CM plugins, add-ons or extensions? Software plugins and extensions are fast and easy options to extend the functionality of your platform. CM plugins enables you to implement our services in your own software through plug-and-play extensions. You are now able to extend your software with the versatile services of the CM platform. Use our fast, easy and affordable solutions to extend the functionality of your software without expensive and time consuming software development. Our plugins are widely used and supported by the community and selected partners. Browse our plugins and start using our services in a few clicks.